Techie Anish's Blog: Make yourself secure online: Password Techniques and more..
Make yourself secure online: Password Techniques and more.. So, basically to make your house secure, you need well, may be a gun, a security locker for valuable stuff and lots more. When you are on the internet, the only thing you can have is a password. And well, following some guidelines that can help you not getting into trouble and becoming a victim of a cyber crime. Well, you might as not well lose your life, but you know dignity and money are on the line. Well, you might think these are outdated and old fashioned, but there are places where keyloggers are used. What keylogger does is that it logs all the keypresses and with a advanced software running in the background, passwords can be known to the person who installed it. Always check for such a thing, this is cuz no law forbids their use. 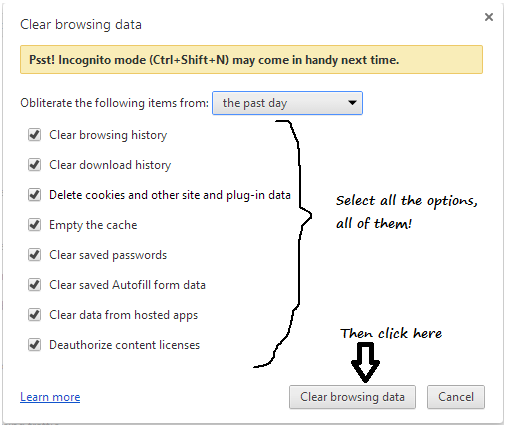 Using Incognito Mode on computers is also an option, but if you even accidently close the windows, all your logins will go. Though more secure, it can sometimes make work complicated. 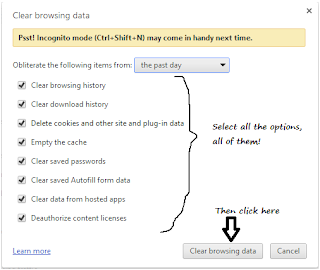 Also change the "Obliterate the following items from" option to your desired one. My choice: "the past day". Problem: Mostly, passwords on websites are first hashed and then stored on the computer. A specific string(group of characters) has always the same hash code. For example, if your password is "securepassword", and someone else's password is also "securepassword", the same hash will be stored as passwords for your user ID. Hash code is basically conversion of normal English language to a complicated code(of base 16,32 or whatever). Solution: Choose a password as unique as possible. Don't use phrases like 'iloveyou', 'thisismypassword', 'pass123', etc. etc. Think of something completely unique and then store your password. If security cracking algorithms are run, the longer your password is more time it will take to finally reveal your password. Use of multi words password is more secure than using single word. Its always better to do so. In fact, using the password 'my password is one that is secret' is more secure than '!@JN#$%J(&%HJDDS'. Always devise algorithms to remember your passwords by yourself. This algorithm should also be a secret. 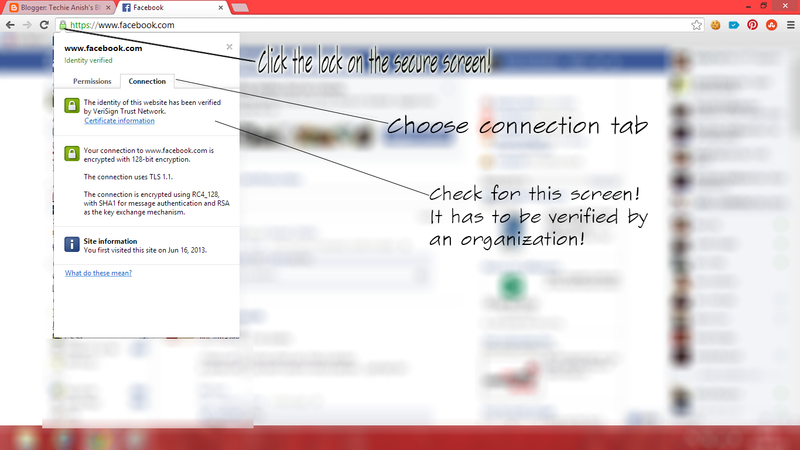 I advise to do this because using a secure password algorithm, will help you remember them easily. Algorithm is basically a step by step guide that you remember to store your passwords in your brain. Any website, just about any website unless the one you trust wholeheartedly, always check for a security certificate. How to do so? If no verification, just don't submit it at all..
Well, did I miss something, comment it! Do let me know view on this article, comment!